Última portada de la edición de Julio de la revista “ROCK INK! – ROCKER’S TATTOO NEXT ROUND-” En la portada de la revista aparece Kyo de DIR EN GREY”. Las fotos de la revista fueron tomadas por Shigeo kikuchi, quien trabaha coo fotógrafo desde 1986. Hasra ahora ha tomado fotos más de 300 portadas para DVD y CD para bandas de punk, rock y heavy metal. ¡Si estás interesado en tatuajes es sin duda al que te va a interesar! Lately the cover of the July issue of “ROCK INK! 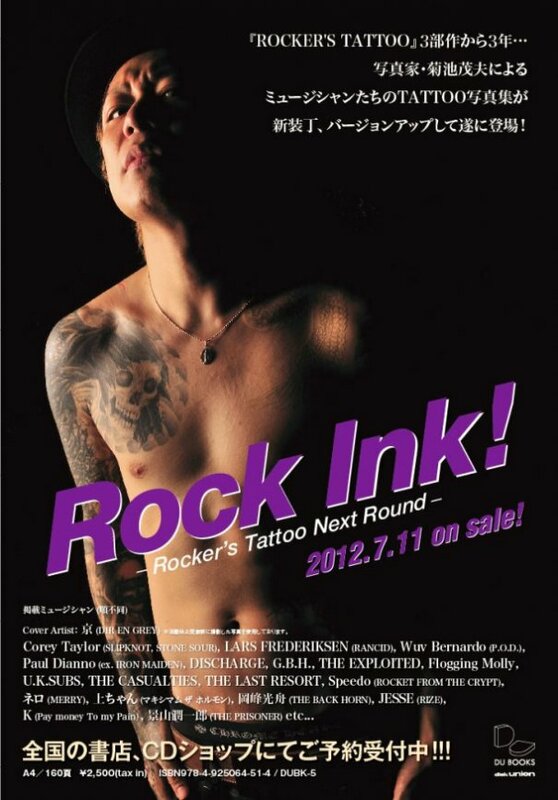 – ROCKER’S TATTOO NEXT ROUND-“ has been revealed and it’s no other than Dir en Grey’s Kyo who covers the magazine! The magazine features photos taken by Shigeo Kikuchi who’s working as photographer since 1986. Up until now he has taken photos for more than 300 CD- and DVD jackets of punk, rock and heavy metal bands! On July 11th the July issue of “ROCK INK! – ROCKER’S TATTOO NEXT ROUND-“ will hit the stores including photos of Dir en Grey’s vocalist Kyo showing his range of tattoos. The photos were taken by Shigeo Kikuchi before Dir en Grey announced their hiatus due to Kyo’s voice conditions. Other artists featured in the magazine are SLIPKNOT’s Corey Taylor, MERRY’s Nero, THE BLACK HORN’s Okamine Koushu, IRON MAIDEN’s former member Paul Day and many more. If you’re interested in tattoos this is surely something to keep an eye on!